If I asked you what the messiest and most unorganized room in your house is, what would you say? I know that for me personally, the kitchen is definitely one of them. Even though our kitchens can be extremely unorganized at times, it definitely has the potential to be the exact opposite. Besides, there are plenty of cabinets, drawers, shelves, racks, and more for you to store all of your things in. But let’s face it…it’s also where our kids leave their unfinished dinner plates, where our husbands leave their stuff after work, and where we place things that we don’t have a home for yet. And not to mention all the cabinets and drawers that are filled with cooking utensils and supplies that can barely fit! Opening up your kitchen drawers when preparing to cook a fresh meal for your family shouldn’t bring you stress and chaos, but much of the time it does. But what if I told you that I have the perfect solution? One that will ensure that everything fits in place, doesn’t take up too much space, and allows you to access everything that you need with ease, and without worrying about something else tumbling out. What you need is some pull out organizers for your kitchen drawers. Pull out organizers are great because they allow you to access and reach the things that you need simply by sliding them out, and they hold everything in place. 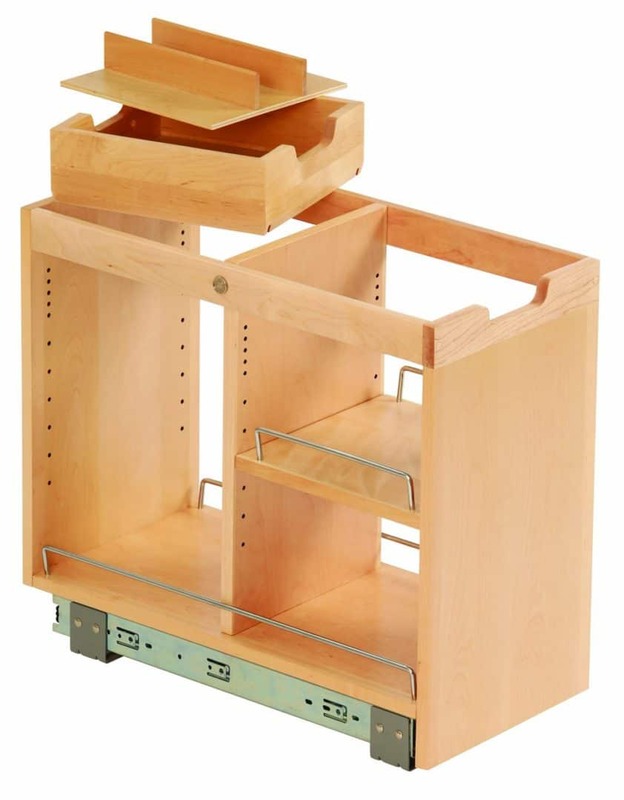 It’s like a rack on wheels that organizes all of your cabinets and drawers. So, I have decided to put together a personal, hand selected list of my absolute favorite kitchen pull out organizers that I know will work excellently for yours, too. Are you ready to start organizing your kitchen drawers for a simpler, and cleaner life? If so, then here are the Top 5 Best Pull Out Organizers for Kitchens. Before we get straight into the list, it is important that you know these three essential things before looking for and buying your pull out organizers. 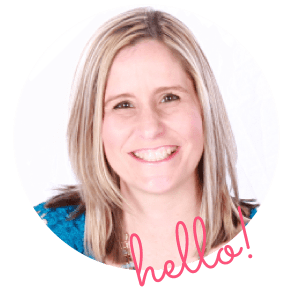 Knowing these will make your life so much easier when considering different products, and it will especially help you make sure that the one you finally decide on truly is the one for you. Besides, the last thing you want is to end up with a product that isn’t the way you expected it to be, or finding out that you could’ve ended up with a better one. So, without further ado, here are the top three things that you need to know before purchasing your very own pull out organizers. 1. Not All Pull Out Organizers are the Same. While this tip might seem a bit obvious, do not overlook it. Pull out organizers for kitchens come in all different shapes, sizes, forms, colors, dimensions, and so much more. This wide variety to choose from gives you both more freedom and more to think about. For example, there are pull out organizers that hold your items in place through tall racks and dividers, while others are simply metal trays that slide in and out of your cabinets. Knowing what kind you want and need beforehand is a great idea, and will help you know what exactly to look for. 2. Know How Much Room You Have to Work With. The second tip I have to give you is to know exactly how much room you have to work with, especially if you plan to put the pull out organizers in your cabinets, drawers, or shelves. This step is extremely important because in order to know what size pull out organizers to order, you need to know what size will fit in the space you want to put it in. So I highly encourage you to take a moment and find out the dimensions of your cabinets, shelves, or drawers in order to be better prepared to start shopping for the best pull out organizers for your kitchen. Another reason that this is such a vital step is because the last thing that you want is to end up with a pull out organizer that you can’t even use, due to it being either too small or too big. This is such a common mistake made in the world of online shopping, but it’s definitely one that you can avoid. All you need to do is take a bit of precaution and to be confident in what you need before spending your money on it. 3. Make Sure That it Isn’t an Eyesore. Third and finally, it is important that whichever pull out organizer you decide to buy is not an eyesore to the rest of your kitchen. What’s the point of buying something that will reduce the stress you experience when looking at your kitchen cabinets, if all it’s going to do is make you sick of looking at it? Since pull out organizers come in all shapes, forms, and sizes, that means you get to be picky about the one that you settle for. Because of that, make sure that the one you finally order is an organizer that you will enjoy looking at each time you pull it out. This is an especially important tip if you plan to have your pull out organizers in plain sight, such as in a shelf or sitting on your kitchen counter. You definitely don’t want to be embarrassed by it whenever you have guests over. 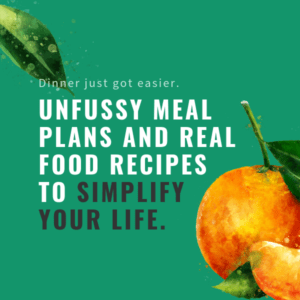 All in all, the best pull out organizers for you will be the ones that solve your unorganized kitchen chaos, fit in all of your cabinets and drawers, and are ones that you feel proud of. Now that you know the important things about finding and buying the best pull out organizers for your kitchen, it’s time to introduce you to the best candidates. Each one of these pull out organizers have been personally hand-picked by me because I am confident that they will suit your fancy (and your kitchen cabinets) perfectly. Plus, each one has its own unique features and characteristics, meaning that you have a wide variety of options to choose from. So whether you like simple or complex, silver or wood, trays or racks, you will see it on this list. One more thing before we start: it’s important to know that there is no specific ordering to the organization of this list. For example, the products are not listed in order of best to least, cheapest to most expensive, or any other criteria. They each have their fair share of pros and cons, but I guarantee that you will find plenty of things to like about each one. Are you ready to find your dream pull out organizers? If so, then here are the Top 5 Best Pull Out Organizers for Kitchens! If you’re looking for a great pull out organizer to get your big kitchen supplies into place, such as pots and pans, then I guarantee you this one will do the trick. The Trinity TBFC-2208 is a sliding pot organizer, meaning that it can hold and organize all of your big and heavy cooking supplies as well as fit in your biggest cabinets. Not only will you have a more organized cabinet space, but having this pull out organizer means that you won’t have to take out all of your heavy pots and pans just to find the one you need. Instead, you can simply slide, take a look at each one, and grab it without the others crashing down on you. 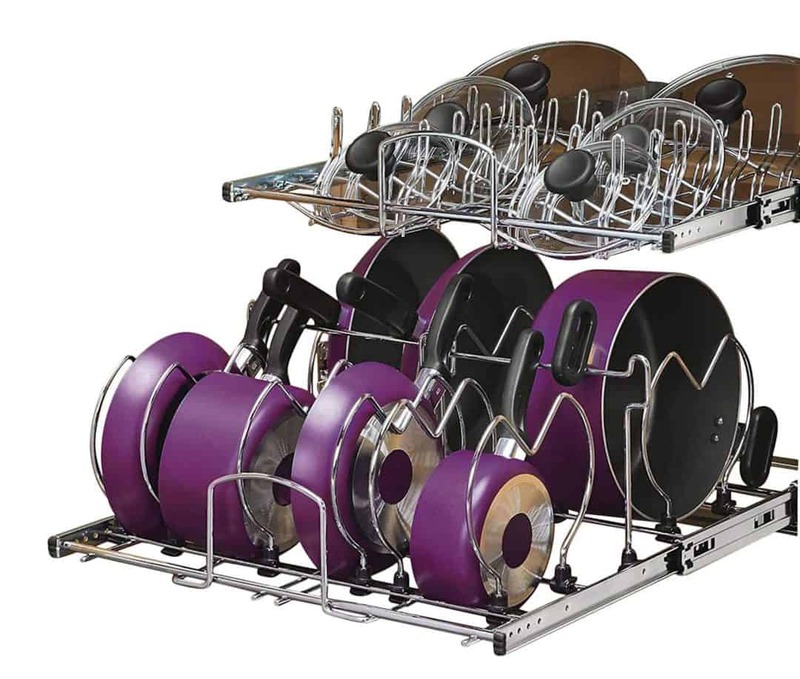 This pull out organizer can also hold multiple pots and pans, as it has 4 large dividers, each with dimensions of 9.5” in width and 8.5” in height. For your smaller pots and pans, it has 4 smaller dividers, each with dimensions of 9.5” in width (the same as the larger ones) but 6.25” inches in height. Plus, you won’t have to worry about stacking too many pots and pans inside of this pull out organizer, because it has a weight capacity of 50 pounds. Do you need a simple yet functional pull out organizer for your cabinets? If so, then I’m sure you’ll love this one. Not only does the Lynk Professional Slide Out Cabinet Organizer come in 8 different size selections, it also fits perfectly underneath cabinets and sinks without taking up much space at all. As long as you have a 15-inch cabinet opening, it doesn’t matter what the dimensions and measurements of your cabinets and shelves are. The Lynk Professional Slide Out Organizer is sure to have the right size for you, so you won’t have to compromise just because it doesn’t have the right measurements. 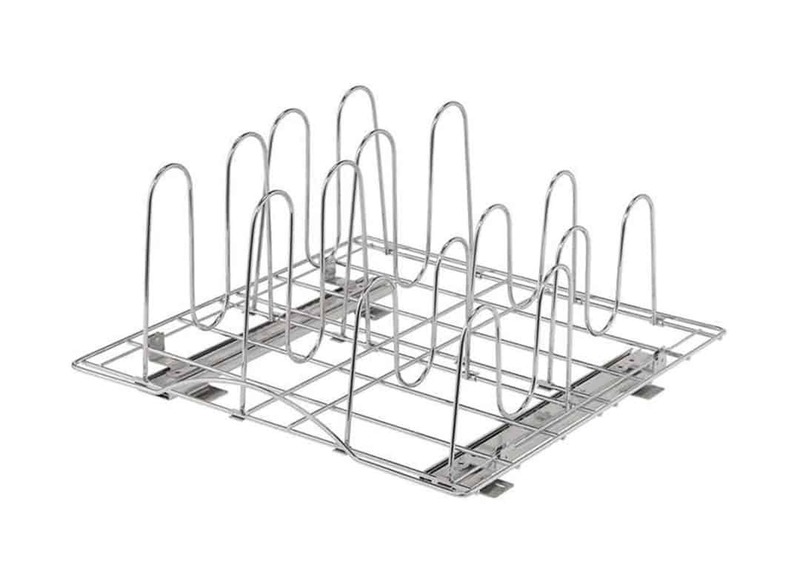 Another great thing about this pull out organizer is that it has its own glide system that makes sure it won’t make any disruptive noises when you pull it out. Hearing screeches and squeaks as you slide something out is perhaps one of the most annoying noises you can hear in your kitchen, but this pull out organizer gives you the silent slides you want. Every kitchen has those few miscellaneous items that are usually tossed into a drawer that’s dedicated to things that don’t really have their own place, am I right? Well, the Seville Classics 2 Tier Pull Out Sliding Drawer & Counter Organizer is absolutely perfect for organizing those types of messy drawers and cabinets. 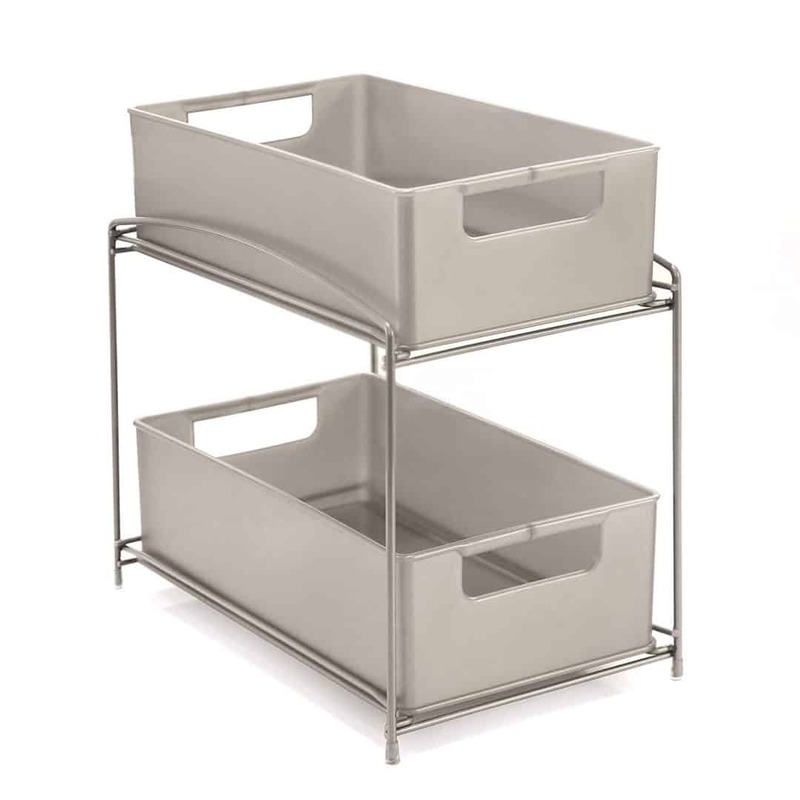 This pull out organizer is 2 tiered, meaning that it comes with 2 removable bins on top of a space-saving and supportive metal stand. It can be put in kitchen cabinets and beyond, such as bathroom cabinets, bedroom nightstands, laundry room shelves, and any other compact space that you can think of. Plus, the removable bins have reinforced handles on each side of them, making it super easy and convenient for you to move them around whenever you may need to. If you’re looking for a pull out organizer that can do practically everything, then this is the one for you. The FindIT Kitchen Storage Cabinet Pull Out not only works great for getting your kitchen cabinets tidied up and back in shape, but it also comes with a half cutlery tray and a shelf. This is great for organization because the more space you have to work with, the less space your things will take up. It fits perfectly inside any 15 inch and 18 inch cabinet, made of beautiful wood and a clear coat finish. This pull out organizer is just like a cabinet inside of a cabinet…except this one can be rolled out for easy access. 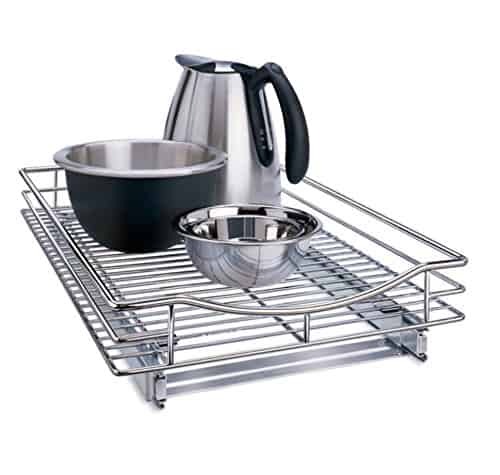 Whether you want to organize your pots and pans or your cups and coffee mugs, these pull out organizers can fit them. This 2 tier and 21 inch pull out organizer by Rev-A-Shelf is meant for larger cabinets that have a 21-inch opening, and can store nearly anything you want to put in it. You won’t have to worry about how much you can put in this organizer, either. It has a 100 pound full extension ball bearing soft close slide system that provides excellent strength and durability while still looking nice and appealing, thanks to its heavy gauge wire construction. Which one are you going to pick for organizing your kitchen cabinets? It’s a hard choice, I know!